Rome is full of wonderful, unique shops, each reflecting the personal taste of its proprietor. The trick is learning where they are and In Rome Now is here to help you. Anna Maria Nardi along with her prestigious company offers a wide variety of services to ensure that your shopping experience in Rome is one of the best. Allow Anna Maria and her experts advise you on shopping for your wardrobe, home etc. Rome market information, including food markets, flea and antiques markets, opening times and general market information. If you are traveling to Rome to do some serious shopping you definitely want to jot down these addresses for department and clothing stores, markets, and more. Buy souvenirs & gifts from Rome & Italy. With every purchase you will get a free postcard sent to you from Rome Italy. Purchase a number of great posters and fine art prints depicting various scenes of beautiful Rome. This is a great guide if you plan to shop while you are in Rome. Make sure to check the links on the right side of the page. 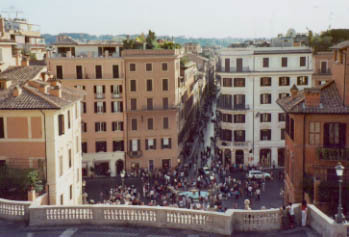 They include information on shops located near the Piazza di Spagna and Campo dei Fiori area. This guide is broken into over 50 categories. Just select a category to find a list of shops, which will include general information and a link to a map that will show you exactly where the shop is located.